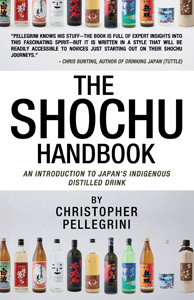 Digital (eBook) download of “The Shochu Handbook” by Christopher Pellegrini. Published July 22nd, 2014 by Telemachus Press. The most comprehensive English language reference on shochu and awamori, Japan’s indigenous alcoholic spirits. Author Christopher Pellegrini, a longtime Tokyo resident, is a certified Shochu Sommelier (SSI) and regularly gives shochu seminars in Japan and abroad. He adores any drink that enhances his meal, and shochu fits the bill more than most. Chapter 1. What is shochu? Chapter 2. How is honkaku shochu unique? Chapter 3. How is shochu made?